Premam is finally here. The film has made a lot of buzz during its production stage as expectations were rife because of the original's historic success in Malayalam cinema industry. Premam also is one of the most trolled movies on the social media as the Malayalam version fans couldn't imagine any others in the place of Nivin Pauly and Sai Pallavi in particular. Let's see if the Telugu version retained the soul and feel of the original or not? It is about three phases of life and love of a man called Vikram (Chaitanya). As a teenager he falls for Suma (Anupama) who is the best looking girl in his village. However things don't turn out as expected and he moves on. After five years, Vikram gets attracted to his lecturer Sitara (Shruti). They fall in love but are separated due to an unfortunate incident. Ten years later, Vikram is running his own restaurant. Now he bumps into Sindhu (Madonna) and he fall in love again. But Sindhu is already engaged to some other person. 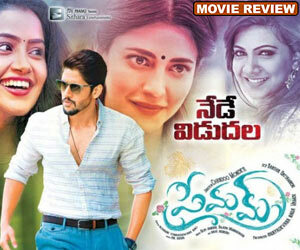 Naga Chaitanya surprises us with his acting proves in the film. He takes the cake for the variations he has shown in three phases of Vikram's life. His look and body language in college episodes is top class. He is also good as a matured man. He could have done better with the teenage version though. Shruti Haasan is beautiful and her chemistry with Chay is impressive. Anupama is cute as the teenager. Madonna is alright. Praveen, Brahmaji, Narra and others have done their bit in the supporting roles. Blink and miss cameos of Venky and Nag clicked. Chandoo Mondeti has proven his skills with Karthikeya, a thriller. He is at ease in handling this romantic drama as well. He is surely a talent to watch out for. The subtle changes he has done to the original's script are commendable. Chandoo added humor to the proceedings without disturbing the soul of the original. Music is the main asset of this film. Most of the songs come as a part of the story and they are beautifully shot. Cinematography is cool with Karthik maintaining the mood of the film with his brilliant work. Editing is fine. Production values are praiseworthy. Director Chandoo Mondeti had a daunting task on his shoulders to retain the original's flavor and make it appealing to Telugu sensibilities. He has come out in flying colors as Premam Telugu version is a classic in its own right. People who have seen the original may draw comparisons, but for those who have not seen the original will give it a thumbs up for sure. To be fair, it pales in comparison with the original which was sheer poetry on screen. However, Chandoo makes it more entertaining and appealing to Telugu audience. The best part of the original was the college episode and Chandoo is bang on in getting that part right. Climax was the weak link in the original and Chandoo couldn't better it despite his best efforts. Premam may not tug your heartstrings like the original did, but it is a pleasant watch that will make you feel nostalgic for sure. Director needs a special mention for keeping the mood light throughout without getting too emotional despite the multiple heartbreaks that the protagonist experiences. Premam will appeal to the urban audience for its sophisticated style of storytelling and feel good nature. B and C centers may find it too slow for their tastes. Premam is not blockbuster material but has the goods and good moments to be a winner. There is a lot of competition during the Dasara season, but Premam shouldn't have any problem as it is entirely different from other films and will have its audience.